Until recently, Huawei's mobile division was still considered by many to be a second-class smartphone manufacturer, far behind established names such as Samsung, LG or Apple. The years have passed and it has to be said that the situation has changed considerably. The Huawei P30 presentation event held in Paris on Tuesday is proof of this. The Chinese manufacturer now seems to be well on its way to dethroning the mighty Samsung, without even having the opportunity to sell its devices in the United States. Who would thought a few years ago that Huawei would succeed in becoming one of the most important manufacturers on the smartphone market? The task was not easy and few people could predict its meteoric rise. Many made fun of the brand's devices because the similarity to some Apple and Samsung models was more than just a coincidence. Now the manufacturer has managed to shake things up and take the second place among the biggest manufacturers on the market. However, the telecom equipment manufacturer's ambitions were clear from the beginning: to conquer the market and propel a Chinese brand to the top. A bold ambition expressed by the company's devices with innovative features and prices that were more attractive compared to the competition at the outset. Huawei P30 Pro vs P20 Pro: can you see the difference? Now, things are very different. Huawei has grown, evolved and developed at such a speed that in 2018 it took Apple's second place in the smartphone manufacturers' ranking. Now a key player in all markets (from entry-level to high-end), Huawei is no longer the upstart, but a major player that it has shaken up not just the telecom market, but international politics. 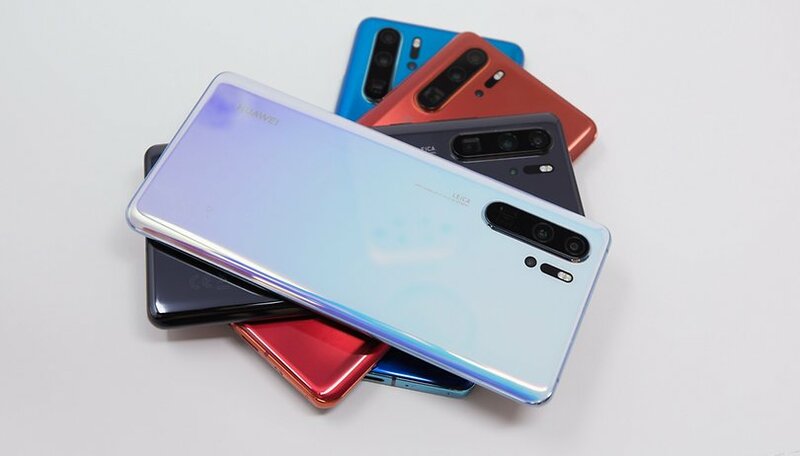 The new smartphones unveiled in the French capital are the striking proof that Huawei no longer has anything to envy its Korean rival. Launched just over a month after the Galaxy S10, the Huawei P30 and P30 Pro, presented by Richard Yu at the Paris Convention Center, offer everything you would expect from current high-end devices. Featuring elegant designs, they offer attractive specifications and durability that users of Samsung's latest devices would certainly appreciate. The software, which was initially criticized (and rightly so), has improved considerably and offers remarkable fluidity. EMUI is nothing to be ashamed of anymore. In terms of innovation, it's the same thing. Huawei does not disappoint. The company was one of the first to use artificial intelligence for its devices. The photo experience on the P30 Pro also promises to be excellent. The Huawei smartphone can count on a 5x optical zoom (and 10x hybrid) and its configuration with three photo sensors and a Time of Flight sensor to be a good choice. Even in the emerging market for folding smartphones, the solution chosen by the manufacturer with its Mate X seems to be more sensible than the Galaxy Fold of its competitor. The other side of the coin is that Huawei is also confident enough to match the prices of Samsung flagships. Chinese devices used to be the 'cheap' option, but the brand has become more bourgeois and now offers its smartphones at prices that are no longer as attractive as they once were. The brand also made efforts in terms of after-sales service. While the initial feedback was not very good in the community, Huawei has since improved significantly.The manufacturer has expanded its network of regional repair centers in Europe to reduce the time required to diagnose and repair phones in the event of a problem. Customer service has also become international with availability in several languages. The manufacturer can count on its resellers. Even if the service is not yet up to par with Apple's, it is now identical to Samsung's. The manufacturer also plans to open physical stores in Europe. Around fifteen are planned in 2019, including one in Paris in the Quatier de l'Opéra. Here, Huawei is more inspired by Apple's policy of opening only a few stores per country and not Xiaomi's policy of increasing the number of points of sale. In any case, this store development reflects the brand's desire to establish itself in people's minds and to be as close as possible to consumers. In terms of advertising, the Chinese giant is investing as much as its Korean counterpart, a charm offensive that physical stores are a key part of. So, what's left for Samsung? While the world leader has reason to be concerned about Huawei's rise, it still retains some advantages over his rival. In addition to making its own displays, Samsung's image is still stronger than Huawei's, as is its fan community, which remains the largest to date. The espionage charges the Chinese firm faces do not necessarily help its image either. What do you think of Huawei's rise to power in recent years? Let us know in the comments below. I disagree with many of your views and I will provide the cold hard facts here. "The Chinese manufacturer now seems to be well on its way to dethroning the mighty Samsung"
Samsung is now releasing the M10, M20, M30 for online flash sales. They are also releasing the A10, A20, A30, A50, A60, A70, A80, A90 phones with very high specs at very low prices in many markets outside the US. So no more easy sales bump for Huawei, Honor and other chinese manufacturers to be World No.1 starting this year. "Huawei has grown, evolved and developed at such a speed that in 2018 it took Apple's second place in the smartphone manufacturers' ranking." Apple were officially ranked number 2 in sales quantity for the entire 2018 in terms of yearly shipment. Not just for 2 quarters like Huawei + Honor. "The new smartphones unveiled in the French capital are the striking proof that Huawei no longer has anything to envy its Korean rival"
Samsung very likely make their OLED display, DRAM, UFS 2.0 and also the periscope lens created by Corephotonics acquired by Samsung just recently. Who is now in a more enviable position in comparison? "Even in the emerging market for folding smartphones, the solution chosen by the manufacturer with its Mate X seems to be more sensible than the Galaxy Fold of its competitor." Mate X is just a media / PR paper tiger just like the Flexpai. The screen is facing outside which means it will always be proned to scratches and getting knocked in one way or the other. On top of that, don't ever drop the phone on a rough and uneven surface or else the plastic screen will get a permanent crease, deformation and also the flexible OLED could be faulty in just one drop and the 2,299 EUROS will be gone down the drain just like that. How is that even a sensible design in terms of durability? I doubt Huawei got the balls to sell this by offering an iron clad warranty. Not to mention also their capabilities in mass producing this in meaningful quantities. I can go on and on but I'm only here to rectify some of your opinions which could turned out to be disinformation to the public. It may have a better camera but the s10plus is an all around better phone. It just supplies all the premium features! i have some Huawei products. Build quality is lacking. Ports fail faster than other brands in my experience. Screen quaility is off, whites tend to run yellow, brightness has difficulty with even dark tones. Bloat is pretty bad but Samsung is worse on that account. Memory management is odd with aggression in shutting things down but leaky as well. Completely agree. Galaxy S phones are still a higher quality devices in all areas. I had quite unhappy experience with Mare 20 Pro after switching from Galaxies and Pixels. Too many questions, drawbacks, inconsistency, glitches etc. So I'm sorry Huawei but there is still a long way to go to Samsung achievements. Victor, I totally agree with you. The EMUI software is much to be desired plus their banned in the US!